“Brave” proves that Pixar is at its best when it creates ideas from the ground up. 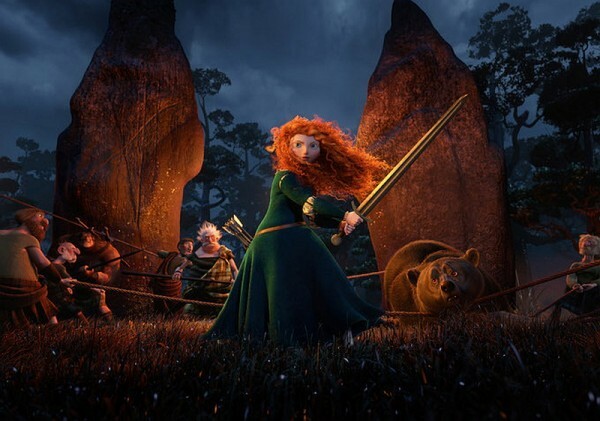 “Brave’s” plot is surprisingly complex, but the movie’s trailer keeps the meat of the story hidden. The movie is set in medieval Scotland and follows Princess Merida of DunBroch, voiced by Kelly Macdonald. Merida is resistant to the traditions and mandates of her royal duties often butting heads with her mother, Queen Elinor, voiced by Emma Thompson. When Merida breaks a tradition, it puts her kingdom on the verge of war with the neighboring clans, and she sets out to make things right. Take away the fantasy elements and “Brave” is really a simple story about a teenage girl and the relationship to her mother. With the fantasy elements added in, it takes on an air akin to stories by the Brothers Grimm and Hans Christian Anderson, not completely dark but not overly light, striking a nice balance. One of Pixar’s strongest points would have to be the way they are able to create an environment and atmosphere that pulls you in within the first few scenes. This works hand-in-hand with the 3-D glasses. Their focus does not involve things flying out at you, but rather pulling you into the world of the story. More often than not you’ll forget that you’re watching a 3-D film. For a computer animated movie, you can tell that the people at Pixar take the time to establish their shots. They build the composition as well as make the movement dynamic, which shows how far the technology has come since the 90s. There is a great attention to detail regarding how the characters move, emote and carry themselves, making the bits of 1’s and 0’s feel every bit as real as a normal person. “Brave” is similar to the early Pixar shorts. There’s no Disney aura looming over the story, and it manages to insert more mature elements that Disney would have never signed off on if this were made in previous decades. I can’t recommend this film highly enough. Pixar has once again raised the bar for not only computer animation, but overall storytelling. They take a story that would have been overly simplified if handled by anyone else and manage to turn it into something that is deep, enchanting and, above all, heartwarming. This goes to show that creativity is not dead in the film industry. On my personal scale, I give Brave a 5/5.